Are you fed up with clients and patients who don’t listen… don’t follow through… don’t stick to the program you have carefully designed for them even after they have agreed that they need your help? How about clients who stick around for a few weeks or a couple of months, but then stop showing up or become MIA, even if they still have paid sessions left with you? Or maybe you have people who continually chase the latest fad and flit from one silver bullet solution to another, despite your proven successes with clients following your tried-and-tested methods? If one or more of these painful scenarios has created challenges for you in your profession, practice or business, then the CHEK 4 Quadrant Coaching Mastery Program is what you need. The 7 CHEK Coaching Principles and how to implement them in your practice. How to identify your clients’ archetypes – a universal drive or calling that is their greatest source of motivation. The difference between Primal Archetypes and Survival Archetypes and how they shape your client. How to coach your clients using the archetype model. How to detect and work with your clients’ habit loops. How to prime change in your clients. How to coach clients through challenges. The structure and stages of coaching your clients. How to use the adult attachment interview. The CHEK Life Alchemy Process. The Health As Higher Consciousness Model. Part 4 of the program unites all of the materials from the previous three parts and helps you to assemble them into a powerful overall approach to coaching your clients. What kind of practice are you running? What kinds of clients do you work with? 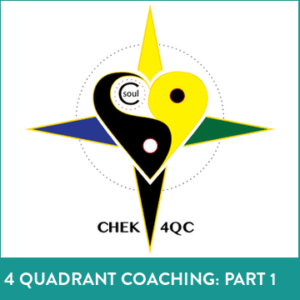 CHEK 4 Quadrant Coaching Mastery Part 4 shows you how to implement all the tools you’ve learned to maximize their benefits for your clients and to grow your practice.